You should be joyful at all times. Make each test in life a time to show pure joy. You learn patience while suffering and not giving up. When you are suffering, hurt, struggling, in trouble or dealing with difficult times, it can be very hard and for some impossible to rejoice or ‘be joyful’. Rely on the Holy Spirit to bring you peace and comfort during such times, give it to Jesus and allow the joy of the Lord to lift you up. I want you to also be aware that God often uses people to bring us joy during our life tests, as Titus did for Paul and the Corinthians (see 2 Corinthians 7). Count it all joy is a phrase used only once in the Bible. But what does it mean when we say ‘count it all joy’? The phrase ‘count it‘ is from the Greek word hegeomai (hayg-eh’-om-ai) meaning to consider or think. The word joy is from the Greek chara (khar-ah’) meaning ‘the cause or occasion of joy‘. 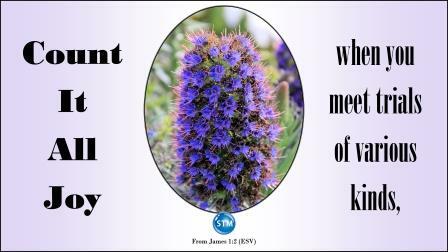 So will you allow me to restate James 1:2; consider each test and trial a reason for happiness. Holman Bible Dictionary says “Joy is the fruit of a right relation with God. It is not something people can create by their own efforts.” This joy comes from the Holy Spirit and is only experienced by the children of God, the born-again [Galatians 5:22]. I am so glad you are here, ‘Be Joyful‘ is one of my favorite Bible studies and the first to include a slideshow. By the time you complete this study, I pray that your understanding will be opened and you will know how to have JOY while you experience the various test and trials that the Children of God will go through. The bottom line is God has given us what we need to go through every test and trial. Enjoy! The phrase ‘for the joy‘ is the Hebrew word chedvah (khed-vaw’) meaning rejoicing; gladness. The Word of God brings conviction and leads to repentance, but it also brings us joy; for the same Word that wounds also heals. “Your words were found, and I ate them, and Your word was to me the joy and rejoicing of my heart; for I am called by Your name” (Jeremiah 15:16, NKJV). “The statutes of the Lord are right, rejoicing the heart” (Psalms 19:8). We stay healthy and spiritually strong when we can face every challenge, obstacle, hardship, test—every situation—and keep up a cheerful or joyful attitude. Hopefully, this Bible study and slideshow (video) will make this message crystal clear. Matthew 5:3-4, 10-12 “Happy are people who are hopeless, because the kingdom of heaven is theirs. 4 “Happy are people who grieve, because they will be made glad. 10 “Happy are people whose lives are harassed because they are righteous, because the kingdom of heaven is theirs. Matthew 5:5-9 “Happy are those who are humble; they will receive what God has promised! 6 “Happy are those whose greatest desire is to do what God requires; God will satisfy them fully! Was Jesus speaking of people in general or of the born again? 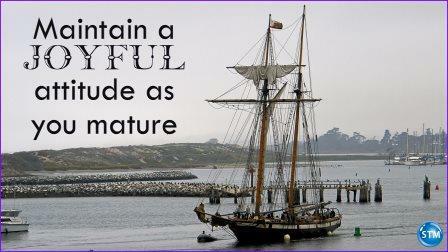 As we mature naturally and spiritually we learn not to let the small things cause us to fall apart. I find it may take a moment to collect my thoughts and pull it together but the Spirit helps to bring that joyful laughter at the thought that something tried to take my joy. Yes, I have learned to laugh and rejoice when faced with the cares of this world that before would have caused a negative response. The Apostles set an example for us. Acts 5:41 “And they departed from the presence of the council, rejoicing that they were counted worthy to suffer shame for his name” [read Acts 5:33-42]. Hebrews 10:32-34 But call to remembrance the former days, in which, after you were illuminated, you endured a great struggle in the face of afflictions; 33 Sometimes you were made a public spectacle by insults and afflictions; and sometimes, because you became companions to those who were so treated. ♥ Question for Joyful – Be Happy: Have you been able to maintain your joy? You might ask, how am I supposed to have joy when my life is a wreck? Or when I am going through the worst time of my life? Hebrews 10:32-36 Remember those days in the past when you first learned the truth. You had a hard struggle with many sufferings, but you continued strong. 33 Sometimes you were hurt and attacked before crowds of people, and sometimes you shared with those who were being treated that way. 34 You helped the prisoners. You even had joy when all that you owned was taken from you, because you knew you had something better and more lasting. 35 So do not lose the courage you had in the past, which has a great reward. Did Hebrews 10 help you? Remember to focus on the goal and not the now. God made us a promise of something better and eternal. Let’s continue; there are a few things we must understand about serving God (slides 1 and 2). The test will not exceed our ability to pass or go through it. In fact, God will help us pass each test. The prize for completing the tests will be eternal life (aka crown of life). We should become better examples of Christ after passing the tests [Romans 5:3-4 and James 1:3]. Troubles/Sufferings/Problems/Trials/Tribulations/Faith tests make us learn to be patient. Sufferings – spiritual advancement; putting the flesh to death, repentance, and abstinence. Trials – a temptation or an adversity, the enduring of which proves the merit of an individual’s faith. Tribulations – great adversity and anguish; intense oppression or persecution. Tribulation is linked to God’s process for making the world right again. Problems – obstacles which make it difficult to achieve a desired goal, objective or purpose. Troubles – to agitate mentally or spiritually: worry, disturb. Perseverance – the steadfast effort to follow God’s commands and to do His work. Endurance – the ability to withstand hardship or adversity. Patience – calm and unruffled temper with which a good man bears the evils of life. Steadfastness – stability in commitment or belief. 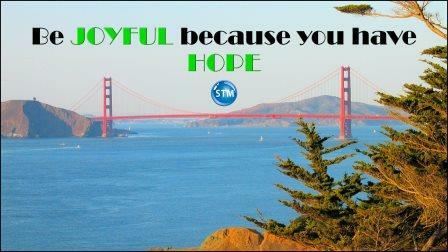 ♥ Question for joyful – endure life tests: While your faith is being tested are you able to stay joyful? 13 But you should be happy that you are sharing in Christ’s sufferings. You will be happy and full of joy when Christ shows his glory. 14 When people say bad things to you because you follow Christ, consider it a blessing. When that happens, it shows that God’s Spirit, the Spirit of glory, is with you. 15 You may suffer, but don’t let it be because you murder, steal, make trouble, or try to control other people’s lives. This is a spiritual refining process. Experience – knowledge gained by trial or practice. Be joyful because you have hope. Hope – looking forward to receiving the promises of God; the certain/confident waiting of salvation, for (future events in) this life and the life to come, through Christ. To expect, wait, count (on or upon), look forward to, and/or trust. It is considered one of the three essential elements of the Christian character, along with FAITH and LOVE [1 Corinthians 13:13; 1 Thessalonians 5:8]. brotherly affection develop Christian love [verse 7]. There is a path to spiritual growth. Start with faith and add other qualities to reach the goal of Godly love. Brotherly kindness (warm friendliness, concern for others) add Love. ♥ Question for joyful at all times: Are you joyful during your Christian development? I am not saying it is not hard at times and definitely not saying we cannot give in to our feelings and emotions. After being born again we are/should be more in touch with feelings and emotions [read Ezekiel 11:19 and 36:26]. Well, you made it to the end, did ‘Be Joyful‘ help you? Did I provide enough scriptures to help you understand how to remain joyful from a Biblical view? Please do not hesitate to contact me via email Tim if you have questions or comments. Hopefully, you have a better understanding of why we can be happy even when we go through life tests and trying times. 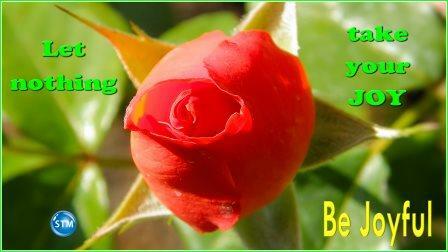 Be joyful my friends and be blessed—Tim ☺. 1 Corinthians 15:12-34 (33); James 3:1-12 (2); 1 Peter 4:12-19 (12-16). Romans 8:18-30 (24-25); 2 Corinthians 12:9-13; 1 Corinthians 10:13 and 15:33; 2 Peter 1:1-11 (3 and 5-7). Common English Bible (CEB) Copyright © 2011 by Common English Bible Scripture quoted by permission. || (ERV) Taken from the HOLY BIBLE: EASY-TO-READ VERSION © 2001 by World Bible Translation Center, Inc. and used by permission. || (ESV) Scripture quotations are from the Holy Bible, English Standard Version, copyright © 2001 by Crossway Bibles, a publishing ministry of Good News Publishers. Used by permission. All rights reserved. || (EXB) The Expanded Bible Scripture taken from The Expanded Bible. Copyright ©2011 by Thomas Nelson. Used by permission. All rights reserved. || (GNT) and (TEV) Scripture quotations marked (GNT) are from the Good News Translation in Today’s English Version- Second Edition Copyright © 1992 by American Bible Society. Used by Permission. Learn to have JOY/be joyful while you go through the various test and trials that the Children of God go through. 1 Thessalonians 5:16-18 Be full of joy all the time. 17 Never stop praying. 18 In everything give thanks. This is what God wants you to do because of Christ Jesus. Go to this Bible study; click on/tap the picture or link. You can be #joyful even when times are hard. Focus on the #hope of a better #life that waits for you. Be happy and learn to be patient during life tests! Romans 12:9-13 Your love must be real. Hate what is evil. Hold on to what is good. 10 Love each other like brothers and sisters. Give your brothers and sisters more honor than you want for yourselves. 11 Do not be lazy but work hard. Serve the Lord with all your heart. 12 Be joyful because you have hope. Be patient when trouble comes. Pray at all times. 13 Share with God’s people who need help. Bring strangers in need into your homes.